<span “>I’m a big softy. 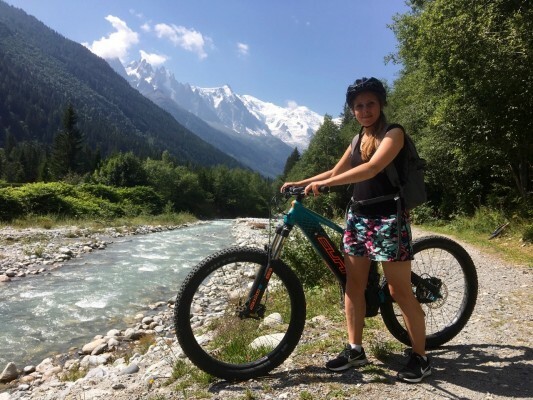 I’m no mountaineer, rock climber nor marathon runner… but when I saw that Inghams are now offering “introductions” to outdoor activities in Chamonix Mont Blanc – one of the most-visited summer resorts in the Alps – I was tempted. <span “>Maybe I was mad? I don’t like heights but somehow I was excited by the idea of tandem paragliding. 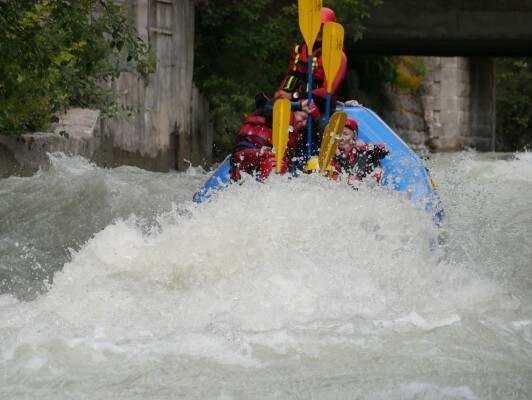 I’m not a strong swimmer but the pictures of white-water rafting depicting such fantastic fun on people’s faces really drew me. And as for mountain biking… well, let’s just say I’m sturdier on two legs than I am on two wheels! <span “>I’m clearly not an adventurous person by any means. But I have always enjoyed exploring the great outdoors: I love the stunning scenery and clean, fresh air. There’s just something about putting the phone down, doing something wholesome and outdoorsy, and just being at one with nature. <span “>So I booked the trip. 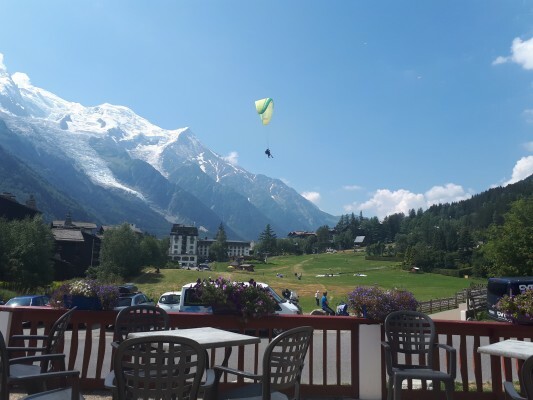 <span “>And there I was, with a group of friends all varying in ages, fitness levels and sporting abilities, sipping a cold white wine on the terrace of Hotel La Sapinière<span “>, marvelling at what is probably the best view in Chamonix: Mont Blanc and the Bossons glacier. 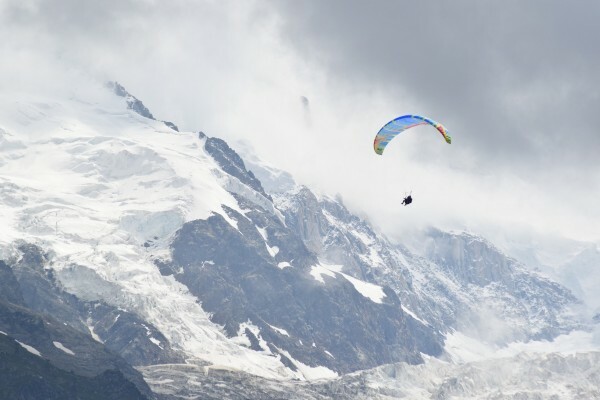 <span “>My feelings of peacefulness and tranquillity were dramatically interrupted when I saw paragliders coming in to land on the field right across the road from where I was sitting. It put my stomach into a spin. Some gliders plopped down gently onto the ground, whilst others bumped along on their bums, not so gracefully. I looked up and some were spinning in circles or twisting from side to side. I contemplated what I was about to let myself in for. Yes, I was mad. The next day, I awoke to the sun shining bright on Mont Blanc, illuminating its peak against the bold, blue sky. It took my breath away, which was about to be taken away even further as I glided up to 3,842m altitude, a head-dizzying height, to get closer to the giant and to soak up some of the most magical scenery I’ve ever seen! I did the ‘Into The Void’ – terrifying as it was, if I can do this, I can certainly do paragliding, I thought. 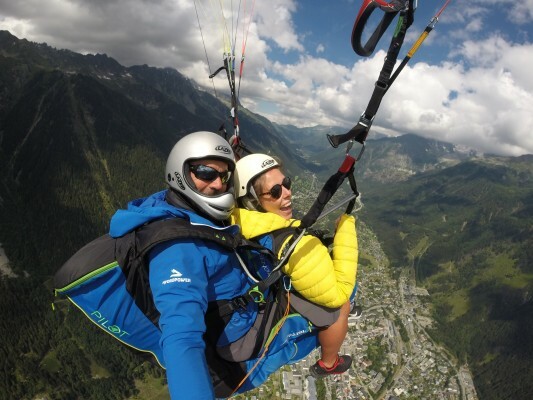 <span “>Then the moment came… we met our friendly guides from Evolution 2 and hopped on the Planpraz gondola, doing our best to allow them to put us at ease as they explained that tandem paragliding is FUN and NOT scary. At the top, we harnessed up on a grassy verge, walkers stopping to watch as they passed by, and me annoying my pilot with a continuous reel of questions: “Is it safe? Am I tied in properly? Is it safe?” “Yes. You’re safe” repeated my pilot confidently. But my nerves deepened when we had to wait for the wind to blow in the right direction. 15 minutes I was waiting for! My heart raced faster each time I watched my friends run off the cliff edge, fighting against the force of the kite as it dragged them up, but hearing their screams of joy and their “Wahoos!” turned my fear into excitement. <span “>My turn. Finally. And I can hardly remember it now. Thank goodness I have this video<span “> as a reminder. <span “>My pilot told me to run forward, to keep running forward, and suddenly the kite lifted and I could no longer run… I was in the air already! “I LOVE IT!” I screamed, and all of a sudden I was relaxed, surprisingly relaxed as I soured high above the take-off point and the walkers below. It was windy and cold and beautiful and quiet and exhilarating and peaceful and heavenly all at once. My stomach stopped churning. The views of Mont Blanc were just staggering. And now, a fortnight on, I’m still buzzing from the thrill of the ride. <span “>We landed with ease and I met my chums, all of whom had smiles beaming from ear to ear, although I still maintain that mine was the biggest! It was undoubtedly one of the best holiday experiences of my life! 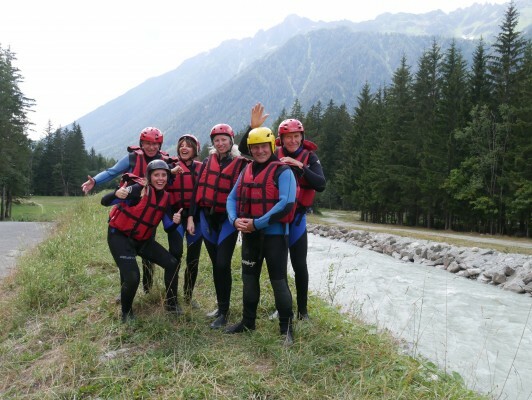 <span “>Over dinner, we couldn’t stop reflecting and sharing photos of our brave flights over the Chamonix Valley – we now all felt like we could conquer the world – and we just got even more excited for our next activity tomorrow: white-water rafting. I ran up to bed early, but I couldn’t sleep. After a hearty cooked breakfast, we headed down to the meeting point for rafting. 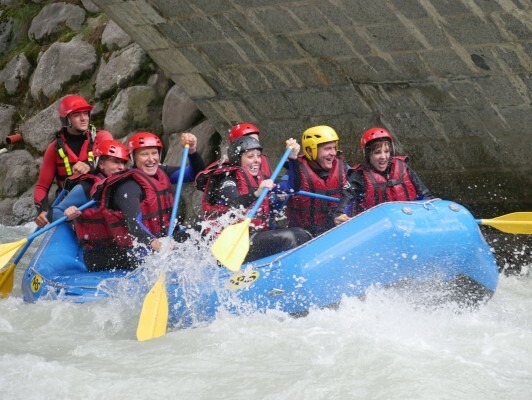 Our guide Leo (who all the girls swooned over) gave us wetsuits and took us up in the van to the starting point; we were to go white-water rafting through Chamonix centre, along the River Arve (you can also go through the Mont Blanc tunnel into Italy and try it there). He demonstrated how to sit in the dinghy, how to paddle… and what to do if you fall in the water. Suddenly, the fear was put straight back into me: I didn’t want to fall into 3oC glacier water! What if I swallowed it or my make-up ran? <span “>Leo’s top tip before setting off: dunk your head in the water to get used to the temperature (thanks Leo). He promised it would be the hardest bit and we wouldn’t get a shock after that. I trusted him, I was brave – I’d already proved that yesterday with paragliding. And I was now a gnarly outdoorsy person. So I did it. My make-up ran and I put up with it. <span “>It did actually help, especially since no longer than 30 seconds after we set off, a wave of water crashed into my face, taking my breath away once more! But I battled on. “FORWARD!” shouted Leo, and we paddled hard, chanting to the rhythm of “Forward. Forward. Forward. Forward.” Being frequently interrupted by further currents. Then there was the big one… the tsunami. I looked at my friend Jane, who was sitting at the very front with me, and we screamed with both terror and laughter. <span “>“Bump!” shouted Leo, and we all leapt into the centre of the boat, oars up. A wave came crashing down, and everyone suffered the consequences. I looked behind me though, and all I could see were big grins and smiles. It was hilarious! <span “>The whole thing took about an hour and we paddled nearly 8km in that time. And when it came to an end, we were all gutted to finish. <span “>We stumbled out of the boat, went and got changed and celebrated our accomplishment of another mini adventure with a beer. <span “>The rest of my active holiday with Inghams made memories that will last a very long time indeed. I just can’t put into words how beautiful the scenery of the Chamonix Valley is! On our last day, we visited the magical Ice Grotto carved into the Mer de Glace glacier. We had lunch overlooking this beautiful spectacle on the terrace of Refuge du Montenvers, an historic mountain hotel built in 1880 to accommodate some of the world’s first famous mountaineers. In the afternoon, we mountain biked up along the valley towards the Swiss border. Whilst, for me, this was actually scarier than paragliding (for fear of falling off and bruising a knee on a rock or raised tree root), I still loved riding through the woods and meadows! <span “>At the end of the trip, I felt strong, proud, brave and refreshed. It taught me that softies can still be (a little) adventurous and can still discover the great outdoors in more ways than one. I may never be a mountaineer, rock climber nor marathon runner, but I now know that you don’t have to be young, fit or sporty to enjoy the mountains in summer. I’m not mad, I’m a converted thrill-seeker! 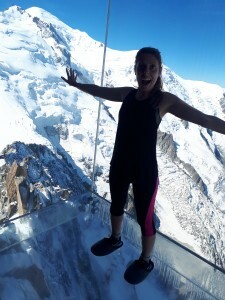 Alpine Wildife – Chamonix’s top 5 inhabitants! Inghams is a brand of Hotelplan Limited, “part of the Hotelplan UK Group” © 2018. All Rights Reserved. Registered in England and Wales as Hotelplan Ltd. Registered No 350786. ABTA V4871. VAT No: GB 217 4698 42.